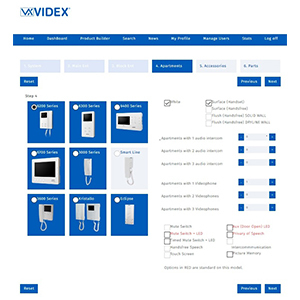 Videx, the experts in door entry and access control, has launched its renowned Product Builder application online. It includes all the features in the original CD Product Builder that enables you to create an access control solution to meet your specific needs, in an easy-to-use step through wizard. Key features of the online Product Builder include a dashboard, where users can see their current and previous builds. They can view, edit, print, create a PDF of their build, and choose to email and share with others if they wanted. The online version provides a very simple 6 step wizard to build any type of system and create a parts list with prices, parts descriptions and images. To register for the online Product Builder, please visit www.videxbuilder.com and choose the ‘register’ option.